The battle to take full control of Mosul from Islamic State will be over in a few days after an attempted fightback by the militants failed, an Iraqi general has told Reuters. “Only a small part remains in the city, specifically the Old City,” said Lieutenant General Abdul Ghani al-Assadi, commander of the Counter Terrorism Service (CTS) elite units in Mosul. The area now under IS control in Mosul, once the militant group’s de facto capital in Iraq, is less than two square kilometres, the Iraqi military said. 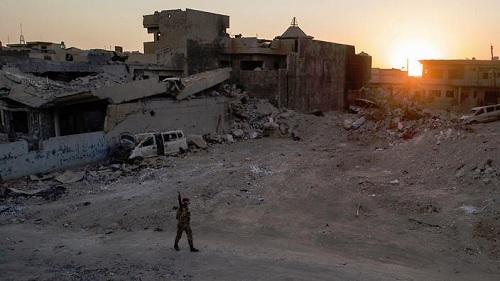 An attempt by Islamic State militants late on Sunday to return to neighbourhoods outside the Old City failed, Assadi said, adding the city would fall “in very few days, God willing”. The militants last week destroyed the historic Grand al-Nuri Mosque and its leaning minaret from which their leader Abu Bakr al-Baghdadi declared a caliphate spanning parts of Iraq and Syria three years ago. The mosque’s grounds remain under the militants’ control. Iraqi troops captured the neighbourhood of al-Faruq in the northwestern side of the Old City facing the mosque, the military said on Monday. Iraqi forces took the eastern side of Mosul from Islamic State in January, after 100 days of fighting, and started attacking the western side in February. Up to 350 militants are estimated by the Iraqi military to be besieged in the Old City, dug in among civilians in crumbling houses and making extensive use of booby traps, suicide bombers and sniper fire to slow down the troops’ advance.